PETALING JAYA: The nation's largest asset manager, Permodalan Nasional Bhd (PNB), has taken the step of reassuring stakeholders of property developer SP Setia Bhd that it does not intend to seek an active role in the management of the latter despite a bid to increase its stake. PNB president and group chief executive Tan Sri Hamad Kama Piah Che Othman, who issued a joint press release with SP Setia president and chief executive officer Tan Sri Liew Kee Sin, said the asset manager's role was to look for good companies to invest in and not to manage those companies. Hamad had met Liew last Friday following concerns over the fate and future direction of the company after PNB made an offer of RM3.90 per share and 91 sen per warrant with the aim of increasing its stake to more than 50%. “Tan Sri Liew will continue to lead SP Setia as its CEO. The existing management team will also continue to manage the company with the same high professional standards and spirit of excellence which has caused SP Setia to be voted number one developer in Malaysia time and again,” he said. Hamad added that PNB's involvement in its investee companies was mainly through board representation, while the day-to-day operations were left to professional managers. PNB was seeking to increase its stake in the company because there was a disconnect between the fundamental value and share price caused by the global market turmoil, he said. “As a long-time shareholder of SP Setia, and more recently a substantial shareholder owning more than 30% of the company, PNB fully appreciates the strong branding and deep-embedded value which has been created in the company through its entrepreneur-led management team,” he said. He said the asset manager was also committed to maintaining an appropriate shareholding spread with the capacity to attract not just local but also foreign institutional funds and retail participation once the market stabilised. Liew, on the other hand, was heartened by PNB's reassurance that it would continue to work with the existing management. He expressed confidence that SP Setia would continue to have a bright future with solid growth prospects and thus create greater value for all stakeholders with the strong backing of PNB as a supportive long-term institutional shareholder committed to working synergistically with SP Setia's management. However, Liew reiterated the board's advice to non-interested shareholders to wait for both PNB's offer document and the independent advice circular before deciding on their next move. 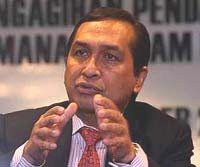 “This is to enable all shareholders to make a more informed decision regarding their investment in SP Setia,” he said. AmInvestment Bank Bhd was appointed the independent adviser for the offer. According to Bloomberg data, PNB together with Skim Amanah Saham Bumiputera has a total stake of 31.73% in the company.